You are buying Enfamil Infant Formula Single Serve Powder Packet 17.6g 16/bx, Model #136527. ADW Diabetes offers a complete line of Enfamil baby formula products both in liquid and powder form. We offer these items in both single and discounted bulk quantities for your convenience.Trust ADW Diabetes for your Enfamil baby formula needs as we offer excellent pricing and superior service. The Enfamil Infant Formula Single Serve Powder Packet 17.6g 16/bx is part of Enfamil Staged Nutrition - inspired by the changing nutrition of breast milk. Learn more about Enfamil Newborn and Enfagrow Toddler, too. 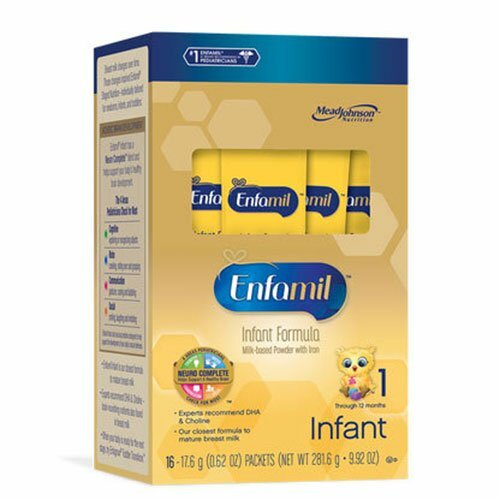 Enfamil Infant is nutritionally tailored to help support older milestones like grasping. Choline and DHA, important brain-nourishing nutrients. Enfamil's nutrition helps support milestones like grasping and rolling over. Natural Defense Dual Prebiotics® Blend - designed to help support your baby's own natural defenses. A formula blend that's closer to mature breast milk than ever before.